A well-tended garden is definitely something to take serious pride in — and that pride wouldn’t be complete without sharing the fruits of your labour all around with neighbors and family. 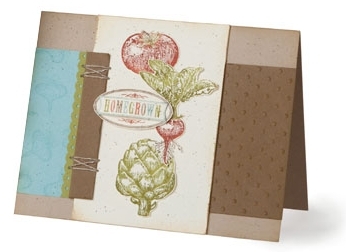 Homegrown and handmade, this card is suitable for any gardening enthusiast! With its charming life-like vegetables, images in our Homegrown set remind us that many great things in life are worth waiting for.